Wynton Marsalis is every bit the national treasure that Leonard Bernstein was and it seems that we in the Tanglewood orbit keep getting luckier. This was dubbed the Bernstein Centennial Summer, and the Boston Symphony Orchestra segment of it was bookended with concerts by artists representing the city of New Orleans, currently in the midst of its own Tricentennial celebration! 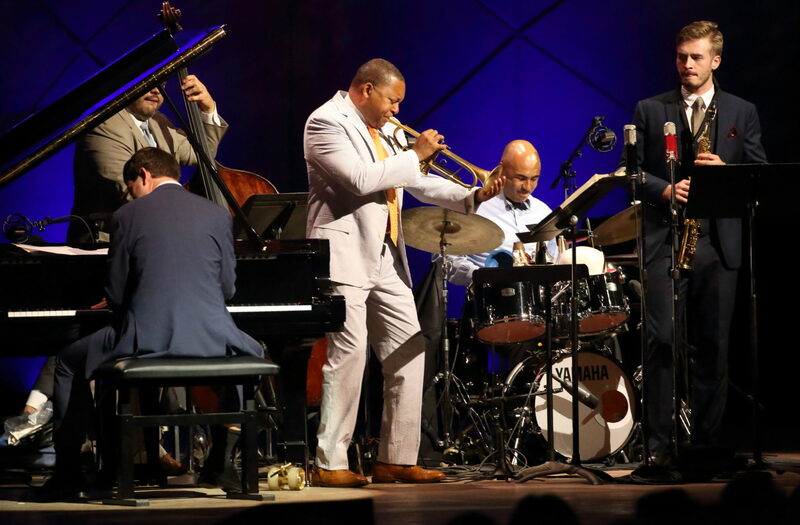 Wynton Marsalis Quintet at Tanglewood Sept. 1, 2018; Hilary Scott photo. Somebody ought to profile those two quintessential American musicians – wouldn’t you love to read a study that compares and contrasts the lives and work of Leonard Bernstein and Wynton Marsalis? To all appearances they are utterly different, yet exactly alike as American musical artists. Donald Hall, their late poet peer, who also performed in the Koussevitsky Music Shed (as a guest on the 2008 A Prairie Home Companion), wrote about “…poetry’s continuous assertion that opposites are identical. '” I don’t think he’d mind if we substituted ‘music’ for ‘poetry,’ in order to properly align these Tanglewood Fellows, Bernstein and Marsalis. 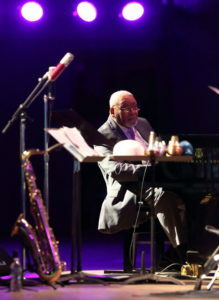 The quintet headed by Ellis Marsalis, father of Wynton, played a flawless opening set, almost equally divided between covers and original material. 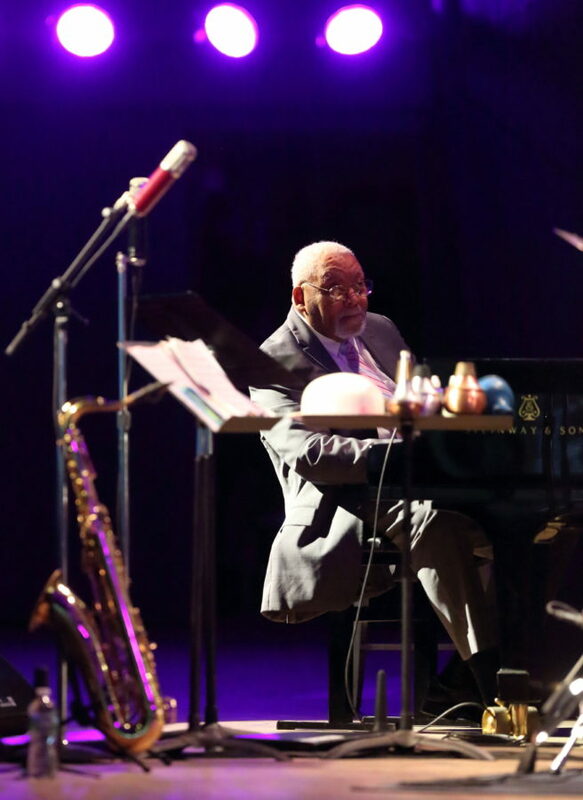 The patriarch of the first family of New Orleans musicians (son Brantford has also headlined shows here) is an impressive presence with a deft but airy touch on the piano, with a minumum of talk between pieces. This was a home game for Wynton, who recalled being in the Tanglewood Music Center Orchestra under the direction of Leonard Bernstein for a performance of the Prokofiev Fifth in 1979. Marsalis, while singling out Gunther Schuller and trumpter Roger Voisin, besides Bernstein, for praise, stated simply that Tanglewood changed his life. Before the concert, we heard someone talk about the 1999 program here with the BSO and Seij Ozawa plus Wynton Marsalis and the Lincoln Center Jazz Orchestra combining to perform the Peer Gynt Suite, which Duke Ellington adapted for jazz orchestra. The concert attracted a lage Lawn audience, but a rather sparse gathering in the Shed. Perhaps Ozawa Hall was the more suitable venue for this program?